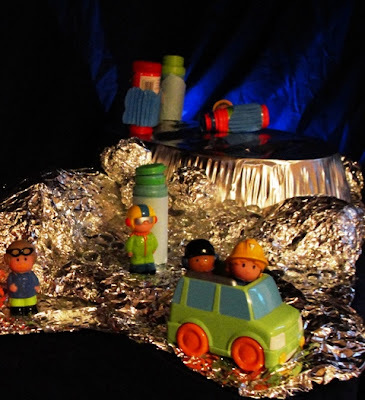 Give a man some tinfoil & see what he creates! My hubby came up with this space station! Made from recycled materials & some good ol' kitchen foil. 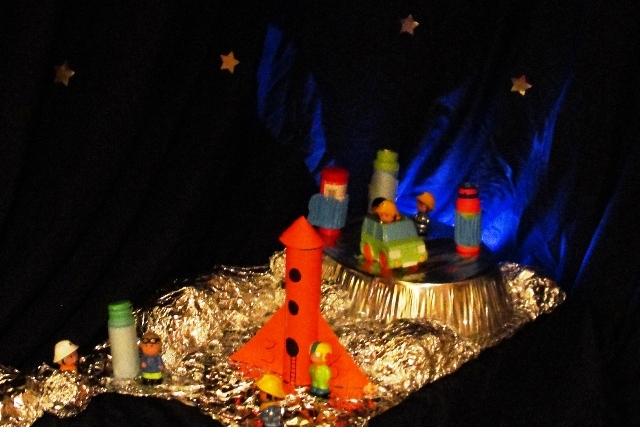 After Minnie had gone to bed he set to work transforming one of our storage units into outer space. He pinned up the navy sheet that we used in our nocturnal play scene, & draped it across the storage unit. 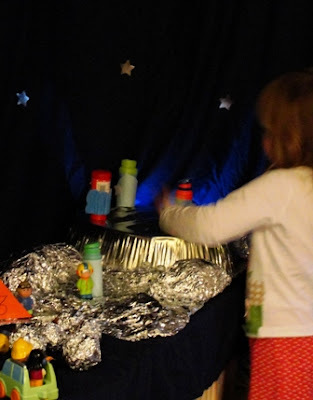 Using the side of cardboard box covered with a layer of kitchen foil, he attached an upturned foil food tray (like the one we used for our winter play scene) & secured with sticky tape. 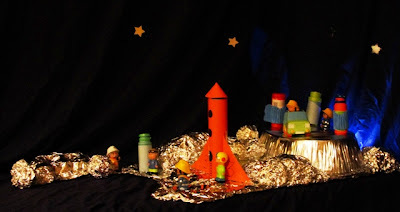 To decorate the base he scrunched up a few sections of foil to create moon rocks. 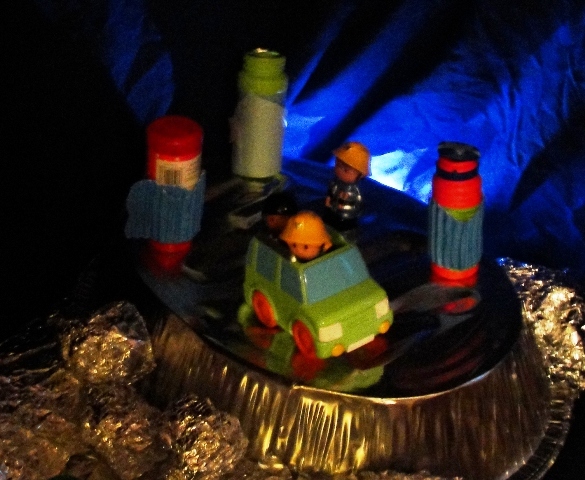 The scene was completed with a foil covered egg box, plus a few play people astronauts & a car space buggy! To create a glow around the Moon, my hubby added a small battery operated light behind the moon base. 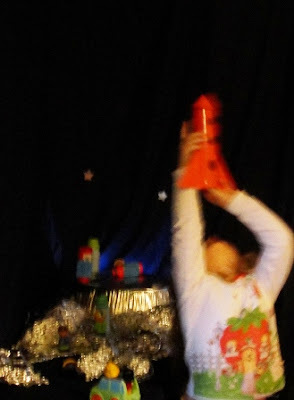 During the day Minnie had been making rockets using empty bubble bottles, double sided tape & card. She instigated this activity herself (collecting the materials, & making these independently). I think they are pretty amazing! She even made sure there was enough room for the astronauts to sit inside! 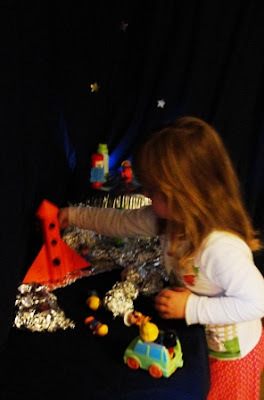 As soon as Minnie found the space station the next morning, rockets were flying, astronauts were dancing & the space buggy was collecting moon rocks! Soon a trailer had been added to the space buggy to carry all the moon rocks back to the base! Apologies for the quality of the photos, it was pretty dark when they were taken. And the great thing about this small world play area is that Minnie & her Daddy both had a hand in creating it, & have been enjoying playing with it together! Fantastic! I'm looking forward to seeing what they'll create together next time.